TRG Talk: Cloud – Why Cloud? with the topic of “Cloud Enablement” was successfully held on the morning of December 20th at PJ’s Coffee Sala. In particular, the event proudly welcomed two specialists from Amazon Website Services, Mr. Hoang and Mr. Paul Chen. 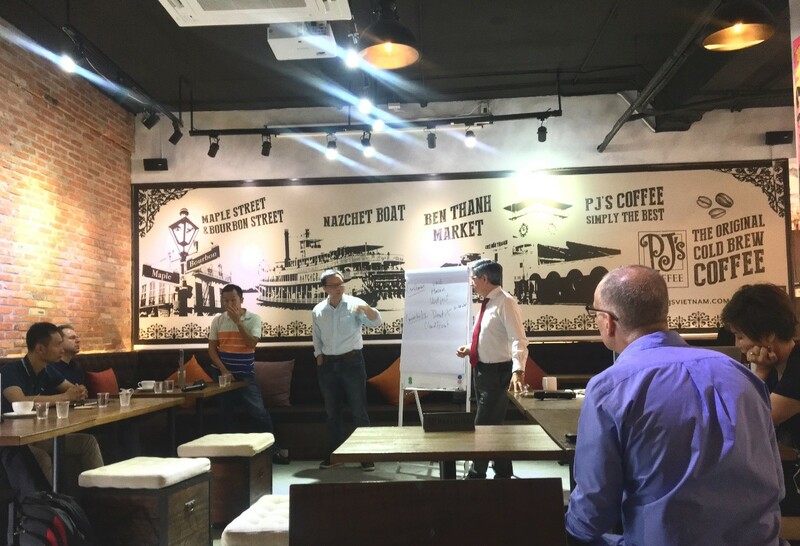 Moreover, this was the first co-organised TRG Talk: Cloud by TRG International, Amazon Website Service Vietnam (AWS) and British Business Group Vietnam (BBGV). The seminar began with the introduction delivered by Rick Yvanovich – Founder & CEO of TRG International. Through TRG Talk, Mr. Yvanovich hopes to clearly explain the way Cloud operates and how Cloud can be beneficial to the businesses. TRG Talk became exciting when participants started to ask questions and discussed with speakers about Cloud’s outstanding features. Mr. Doron Shachar – CEO of Renova Cloud, shared his thoughts about the fast developing era of Industry 4.0, where most of the multi-national enterprises have already been spending a significant amount of money to invest in Cloud. However, there is still a portion of businesses learning about the optimal solutions that Cloud offers. With Cloud, business groups can flexibly choose suitable cloud model to determine the location of the enterprise’s virtual data centre. Cloud can offer countless applications, endless changes in order to suit the budget of businesses. Not only does it can be customised infinitely, Cloud has the ability to adapt to any change made during installation and usage. For example, business groups may choose to migrate their own networks to a hybrid, or temporarily expand storage capacity, Cloud can be easily adapted to meet their demands. With Cloud, data files are kept centrally allowing your business to manage easily, helping to create a virtual space that everyone can directly participate and discuss. This also means saving time and money for businesses. When Cloud was first created, many business groups was hesitant and questioned its security. However, Mr. Paul Chen emphasised that all activities on Cloud are controlled by a third party and updated regularly to ensure that safety standards are met. With these benefits, Cloud is gradually welcomed by businesses, more and more are transforming their systems to make use of its convenience, save time as well as costs during the operation. More specifically, the workshop also pointed out even small and medium enterprises can be benefited from Cloud’s features. The seminar closes but opens up useful and interesting knowledge about Cloud. In the future, TRG and Amazon Website Service Vietnam hope to bring more seminars, discussions on this interesting topic about Cloud. You have probably heard about it, not once but multiple times. Whether you are new to cloud computing or you are already an expert, anyone can definitely gain something from our interactive workshop at TRG International. This monthly event will have guest stars who are experts in not only cloud computing but also experts in other IT phenomenon. There will be myth debunking, tips and tricks in building a stronger, better IT infrastructure for your business. Come join us for a cup of coffee and a good talk every third Wednesday. TRG Talk - Cloud: How good is Cloud computing?